Parents in Elgin, the bar has been raised for Christmas and birthday gift-giving to a child and this will be a tough one to beat. While new clothes, toys, phones and gadgets are nice, you really can live without them. The following gift is truly life-giving. On Tuesday, Dec. 5, with their family members keeping busy in a waiting room, Rick Starman and his daughter Juliann underwent surgery at University of Nebraska Medical Center (UNMC). 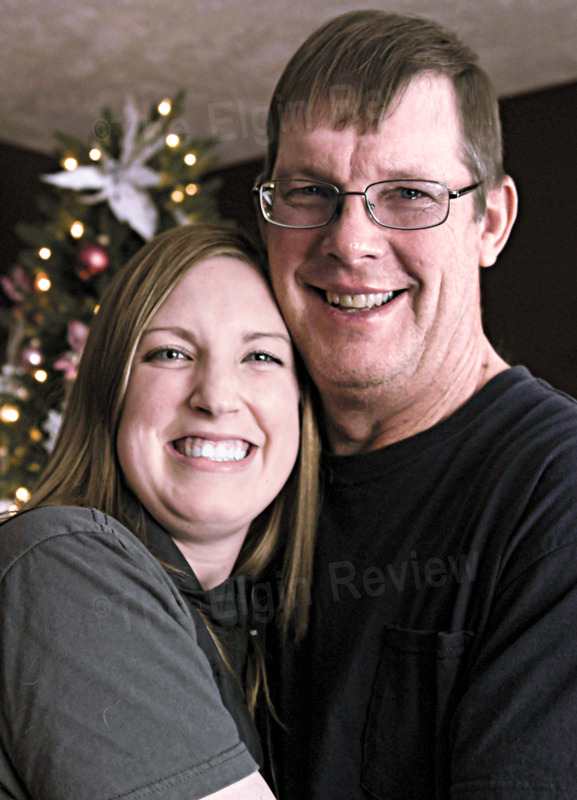 What Juliann needed, and what Rick gave her, was a kidney. The Starman family gathered at their farmhouse this past Saturday to celebrate Christmas and shared their story with The Elgin Review. As Juliann explained, this story began 10 years ago. While a junior at Pope John XXIII Central Catholic High School in 2007, she began to suffer from inflammation. in her knees, fingers and elbows. “It was very hard to bend over, sit down get up..both of my knees were really sore”, she said. She also developed a “butterfly” rash which spread across the nose and cheeks. The diagnosis came quickly, in a matter of months. It was lupus, an autoimmune condition where the body creates auto-antibodies that attack the good cells in the body. Lupus is typically diagnosed in women between the ages of sixteen to the upper thirties/lower forties. The progression of the disease depends on whether “flares” can be kept under control through medication and life-style (diet, exercise, stress, etc). A “flare” is defined as “a measurable increase in disease activity in one or more organ systems involving new or worse clinical signs and symptoms and/or lab measurements. In Juliann’s case, two flares (the first while she was in Texas and the last one after she had moved back to Nebraska – in Columbus) caused the damage to her kidneys. Specialists tried several treatments. According to Juliann, “they tried chemo-therapy, they tried a new drug that hadn’t even been approved yet. Basically, when we decided that the transplant was necessary, we had tried every option there was to treating the kidney disease. It was kinda like the last option, besides dialysis”. Two stays in the hospital over the span of two months last summer signaled that a decision needed to be made at this time. Juliann’s kidney doctor, Nephrologist Dr. Son Tran of Lincoln, connected her to UNMC where she quickly underwent more tests. “They had to approve me first to get me on the list – to make sure I was healthy enough to get a transplant,” she explained. “The next step was to decide on a donor”. It was a family decision, with every member willing to donate if they could. From a family meeting in late spring, it was decided that her brother Adam, and parents Jan and Rick would be the first tested. From those tests, Rick knew he was a good match and that this was the least he could do for his daughter. Up to surgery time, Juliann did monthly blood tests. Then came surgery prep and for the first time, a cross-match test on their blood was done the day before surgery. “Up to this point, they hadn’t actually tested our blood together,” Juliann said. Rick explained that they do “virtual” testing in the months leading up to surgery. The family gathered together and Rick and Juliann were able to see each other. “They set us up right across from each other,” Juliann said. From the first cut to the final “stitch”, the actual surgery took approximately one hour. Jan said that the family had about a five hour wait from the time they started prep to when both Juliann and Rick were in recovery and able to communicate with family. Juliann celebrated her birthday while in the hospital (on Dec. 7th), was released from UNMC three days after the transplant, on December 8, and Rick was released on the following day, Saturday the ninth. Both appear to be healing nicely although Rick admits, “the first week was tough” and he is at the halfway point in terms of what he can do. “I can only lift 10 pounds for six weeks”. Lucky for Rick, it’s winter. “That’s why we did it now,” he joked. Then on a serious note, he added “And she needed it (the kidney) pretty quick”. “They are pretty thorough at UNMC,” Juliann said as she spoke about her after-care. “They actually gave me a whole duffle bag so I have to check my vital signs every day, my weight, blood pressure, heart rate and temperature every morning. I’ll get my blood drawn twice a week so there is a home-health nurse that comes.” Juliann will be doing this indefinitely. As far as the lupus, they don’t anticipate additional problems since the whole process of the transplant and the medications/treatments tend to make the symptoms of lupus simply go away. Juliann works at Cargill in Columbus. “They are amazing, they have been so good from the beginning. I have been so blessed. When I was having a lot of issues, they really worked with me at work,” she said. She had been a supervisor but she now works in the office. As we are reaching the end of the year, having just celebrated Christmas, Juliann took some time to reflect on this whole process and how her family met the challenge head on. The Starmans are a living example this season of how the best gifts don’t come neatly wrapped with a shiny bow on top. They come from the heart.